Six years ago, SHAR apprentice Alberta Barnes posted a blog entitled, “The Value of a Music Degree”. That single article has proven to be the most popular blog SHAR has ever posted. Alberta wrote the article for graduation season. She recounted her own experiences as a violin performance graduate and her journey since that time, hoping that new graduates might find some value in her story. Alberta had already asked herself if her music degree was worth it, and her answer was a resounding YES! But Alberta didn’t arrive at this answer until she examined her own role in music, as a self-described “ambassador of beauty”. The responses to Alberta’s blog were passionate, opinionated . . . and numerous! Many offered practical advice. Some recounted their own experiences. Most shared rewarding and enriching experiences, but, frankly, some shared negative experiences. The responses came from professional musicians, current and former orchestra members, teachers, parents, and even people who never studied music at all. Their candid responses reveal the power of Alberta’s original question, which induced so many people to share some of their innermost thoughts and stories. They are well worth reading again, especially at graduation time. University of Michigan violin professor, Andrew Jennings, posted a very inspiring response, where he shared his thoughts about the world of university and conservatory teaching and how creative artists continue to emerge from this imperfect yet culturally rich environment. A lot has changed in string playing in the past six years, most notably the emergence of musical entrepreneurs, as well as the warm embrace of non-classical styles of playing and teaching within the entire string playing community; and vice-versa. Technology has helped fuel this change, bringing a world of different styles of playing into every home and on every phone. Resources for independent musicians have proliferated, enabling performing artists to have their own music studios, market reach, video production, even apps. Non-classical players have turned to classic violin pedagogy to add to their own toolbox, and classical players have turned to non-classical artists to discover and hone techniques absent from classical pedagogy but which are required in today’s rich musical landscape. What’s really interesting is what has not changed -- in a very real sense, music is harking back to an earlier era, when music making was more of a social interaction than merely a profession. This was apparent at the 2018 American String Teacher’s Association conference, which was a cavalcade of artists, genres and styles, all supporting each other. Indeed, the string music community is stronger than ever because its members are discovering each other, enabling more musicians than ever to embark on their own unique paths as artists. In other words, there has never been a more exciting time to study music! What do you think? I have been asked this question many times and I confess that I have now begun to ask the question to myself. What is the value of a music degree? Is really worth all of the time, energy, and expense? When I decided to pursue a performance degree in college, many people tried to talk me out of it because they thought that I should be working toward something more realistic, more lucrative, and more practical. Were they right? First, of course, there is the practical element behind a music degree. It provides you with valuable playing and/or teaching experience. It may qualify you to teach. It is a powerful method of networking within the tightly connected music world. And, of course, it should make you a better player. In short, it provides the tools that you need to be a professional musician. But you have to fight. It has been and will continue to be the same through all of human history: you must fight for what you love. If you love music and you want to devote your life to it, then it will certainly seem like an uphill battle much of the time. New high school grads will have to work hard in college not only to increase their playing skills but also to network, to find their own opportunities to perform, and to experiment in different genres and venues. New college grads will likewise have to work just as hard to make a place for themselves in the workforce. They will need to market themselves, network, and continue to advance their playing while working to make ends meet. I mean this to be encouraging. It is an exciting frontier not because you will immediately have a high paying job upon graduation but because it is an honor and a privilege to dedicate your life to what you love. When the majority of Americans hate their jobs, the musician has the special honor of being an ambassador of beauty in a world that seems often to have forgotten what beauty is. I am thankful for my performance degree because it has enabled me to work and perform in positions that I would not have otherwise been able to do. I am proud to have pursued what I loved. I value every performance that I’ve had. Besides, I think that studying music is not just a pursuit of technique but is very often a study of what it means to be human. Thus enriched, I do not count it as loss that I, by my own choice, have not “used” my degree in the sense of becoming an orchestral musician or a teacher. Instead I am thankful for the time I had in which I was able to fully devote myself to learning how to speak about love, joy, and the human condition without ever using words. A music degree, thus understood, is invaluable. 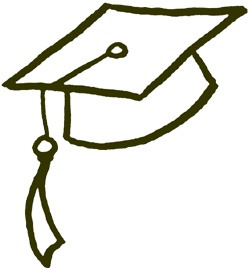 Sincere congratulations to all who are newly graduated!